Vintage 1963 photo of Ferrari 250P S/N 0814 at the 24 Hours of Le Mans the Race Winner ! 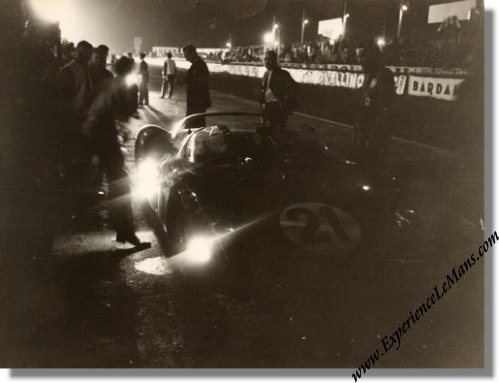 This is a vintage 1963 photo of the Ferrari factory entered Ferrari 250P, which was driven to victory by Lorenzo Bandini & Ludovico Scarfiotti at the 24 hours of Le Mans, taking off into the night after a pit stop. The car covered a total of 339 laps. The car, Chassis Number 0814, burned out in 1966 at St. Jovite - Mont Tremblant and was damaged severely. Nowadays it is the center point of historical and legal controversy during its "restoration". The photo measures some 24 x 18 cm or 9.5 x 7 inches and is in mint condition. The back carries the photographer's stamp.